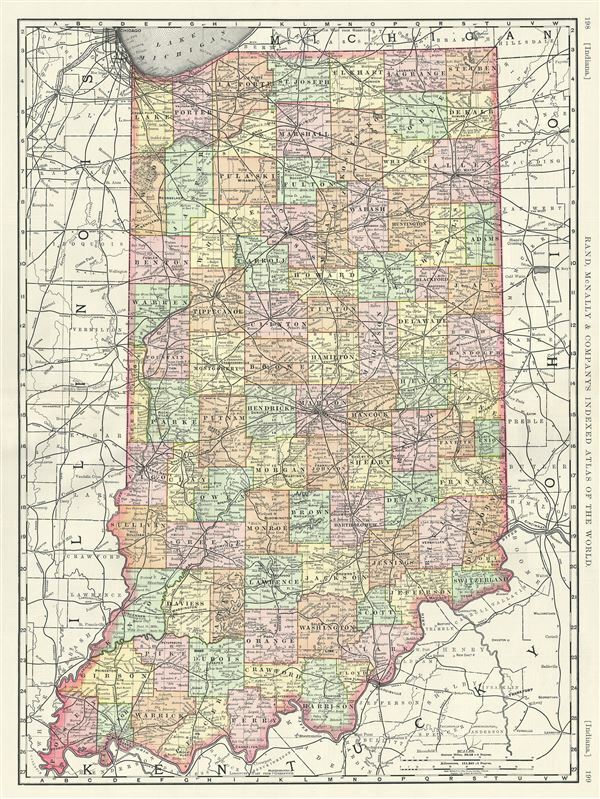 This is a fine example of the 1889 Rand McNally and Company map of Indiana. It covers the entire state in considerable detail. Parts of neighboring Illinois, Kentucky, Ohio and Michigan are also depicted. The map also delineates survey grids and plats referencing the work of the U.S. Land Survey. Various towns, cities, rivers, railroads, and an assortment of additional topographical details are noted. Map is color coded according to counties with elevation rendered by hachure. This map was issued as plate nos. 198 and 199 in the 1893 edition of Rand McNally and Company's Indexed Atlas of the World- possibly the finest atlas Rand McNally ever issued. Very good. Minor wear and verso repair near original centerfold. Text on verso. Rumsey 3565.109 (1897 edition). Philips (atlases) 1026 (1898 edition).